Dear Applicants, If you are searching Delhi Police MTS Admit Card 2018 then here is good news for you. Police department Delhi is going to organize written Examination for Multi Tasking Staff on December/January 2019. Those applicants who have filled online form for 707 MTS Vacancies can download your Delhi Police Admit Card 2018 on or before the exam date. Delhi Police Exam Admit Card Download either from here or from the official website by using Registration No. and date of birth. The Delhi Police MTS Admit Card available from 23.11.2018. Delhi Police Department has issued Notification for recruiting Candidates on 707 MTS Vacancies. Closing Date of Submit Online form is 16.01.2018. After that department is likely to organize written examination for MTS In the month of November 2018. Appliers who are preparing for the exam can download your Delhi Police Call letter 2018 from here on or before the exam date. To get more information about “How To Download Delhi Police Tradesman Admit Card”, Exam Schedule etc. is mention below. Fresh Update as on 15.12.2018: Hello Friends, Delhi Police Multitasking Staff Exam start from 17th December 2018. The last exam will organize on 09.01.2019. Applicants can collect their Delhi Police MTS Call Letter before 10 days of examination. The direct link to download your admit card of MTS Exam 2018-19 is mention on below segment. Fresh Update as on 12.12.2018: Delhi Police Recruitment Department will conduct Multitasking Staff examination from 17.12.2018. The examination will fininsh on 09.01.2019. So those candidates are going to participate in the examination and not download yet Delhi Police Admit Card 2018 can download from here through below link. Fresh Update as on 05.12.2018: Hello Friends, Due to some admistrative reason, the written examination date of Multitasking Staff exam has been changed. The exam venue Time & venue will remain the same. The new dates of Delhi Police MTS Exam 2018 you can check here. Fresh Update as on 03.12.2018: Dear Applicants, here is latest information regarding Delhi Police Admit Card 2018. Delhi Police is going to conduct Multitasking Staff Examination on December 2018. Your exam date is printed on your Delhi Police MTS Admit Card 2018. 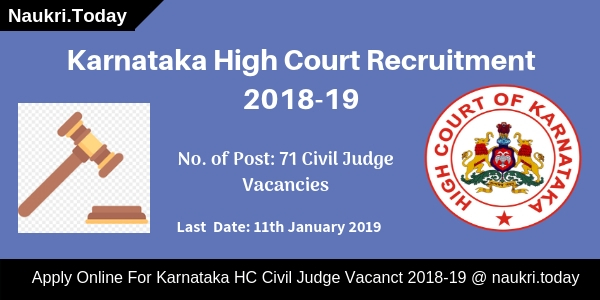 Candidates can collect their call letter to click on direct link, which is mention below. 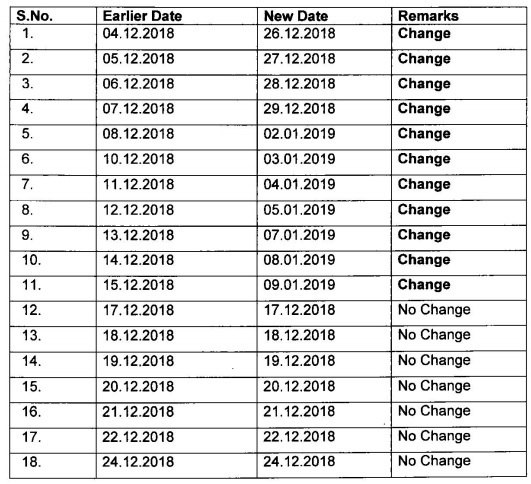 Fresh Update as on 26th November 2018: Candidates those are waiting for Delhi Police Admit Card 2018, now the wait is over. Delhi Police is going to conduct Multitasking Staff Examination on December 2018. The exact date is printed on your Delhi Police Multitasking Staff Call Letter 2018. Latest Update as on 24.11.2018: If you are searching Delhi Police MTS Call Letter then you can download it from here very soon. Now applicants those are enrolled already for Delhi Police MTS Application Form check their application form accepted or rejected. For more latest update visit regularly on this page. Fresh Update as on 22.11.2018:Dear Applicants, here is good news for you. Those candidates have filled Delhi Police MTS Online Form now they can check their application status. You can check your Delhi Police MTS application status using your registration no. & DOB details. The exam date will intimate very soon. You can directly check your application status to click on below link. 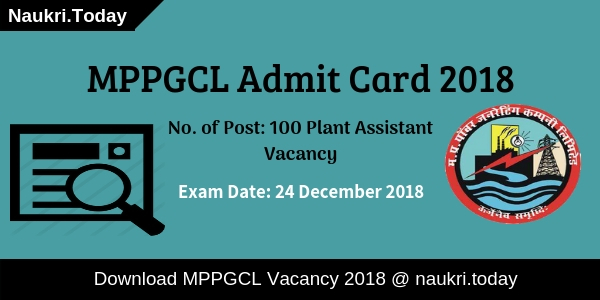 What is the Releasing Date of Delhi Police Admit Card 2018 – दिल्ली पुलिस MTS Exam Date? How I Check Delhi Police MTS Exam Pattern & Selection Method? What is the Importance of Delhi Police Admit Card 2018? How Can I Print Delhi Police MTS Admit Card 2018 – दिल्ली पुलिस मल्टी टास्किंग स्टाफ प्रवेश पत्र? Delhi Police has released recruitment notification of 707 Multi Tasking Staff Vacancies. Online registration for Delhi Police Recruitment started from 17.12.2017. Closing Date for submitting online form is 16.01.2018. A large no. of the application has received for MTS Vacancies. Written Examination for Tradesman Bharti is going to held on December/January 2019. Applicants who are going to attend Examination & Waiting for Delhi Police Admit card, they can print your DP Police MTS Admit Card 2018 from here. Here our team is providing the Direct link to download Delhi Police Hall Ticket 2018 in the below article. More details you can collect by reading the below article. Selection of the candidates for Delhi Police MTS Vacancies will be made on the basis of Department Exam Scheme. Final merit list will prepare on the basis of marks obtained in the examination. Exam scheme is mention below & Pattern of Written Exam is also shown here. You Delhi Police Admit Card is available on at the end of the article. The examination must be OMR based written test. The question paper will contain 100 question of 100 marks. A total time duration of exam 90 minutes. a paper will available in both Hindi & English language. Subject & part wise Exam pattern is mention below: – You can also download through direct link Delhi Police Exam Call Letter. Written Exam is going to held in Delhi Only. Full details about Exam center like Palace, Institute & other you can check from Delhi Police Admit Card 2018. First, download your Delhi Police Multi Tasking Staff Call letter & check all details from it. Those candidates are going to participate in Delhi Police MTS Exam 2018 must collect their call letter of multitasking staff. To download it you must require some details which are mention below. 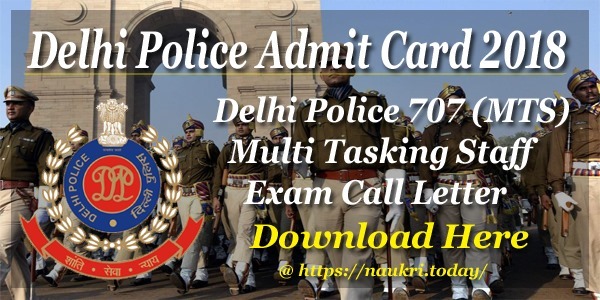 Applicants who want to download Delhi Police Admit card 2018 must read the below steps. These steps is helpful for those candidates who don’t know “How to get Delhi Police Group C Admit Card ?”. First read all the steps properly & then click the link of Delhi Police Call Letter Download. Candidates visit the official website www.delhipolice.nic.in. Now click on MTS Recruitment Section. Then click on Downloading Delhi Police Hall Ticket 2018 link. Fill all details in the form properly. Now your Delhi Police Group C Admit card shown on screen. Take print out of DP Police Admit Card & Check all details from it. Candidates who participated in Multitasking Staff Examination, Are waiting for Delhi Police Exam Result 2019. A Result Consists of a lot of important details such as total marks, cut off, etc. The Department will announce Delhi Police MTS Exam Result 2019. Conclusion: – Delhi Police Admit Card 2018 For 707 MTS vacancies. Candidates can download your Delhi Police MTS Call Letter 2018 from here before the examination date. The exam date is printed on Delhi Police MTS Hall Ticket 2018.
admit card aane par inform kar dena bhai koi. Delhi police mts ki admit card kb aayga . Agr aa jay to please is no pr bta dena please..